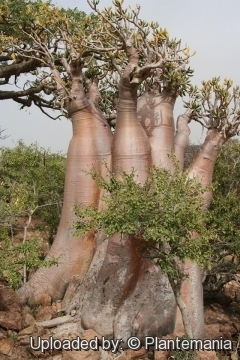 By far one of the most rare and desirable of all succulents it forms in age more of a bush than a small tree (like a dwarf baobab). 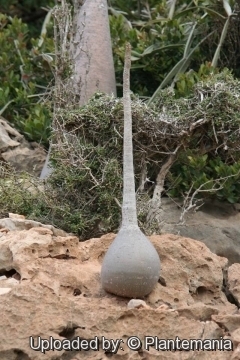 The bizarre succulent stem may achieve a diameter of 2,4 metres. 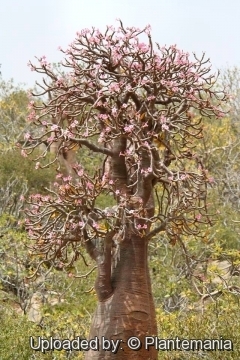 Apparently contradicting its strange appearance, the tree produces a mass of attractive pink flowers in the winter, as a result of which it is also known in the local language as the 'desert rose'. Origin and Habitat: Adenium obesum ssp. 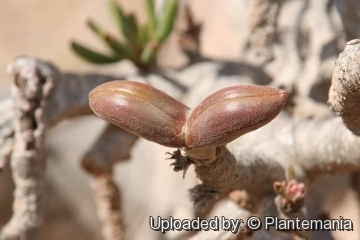 socotranum (Adenium socotranum) is endemic from from the isolated island of Socotra in the Indian Ocean south of the Arabian peninsula and east of the Horn of Africa. For many years Socotra hosted a Soviet naval port and was off limits to most everyone, restricting the availability of plants and seeds. In recent years it is accessible, but the authorities are very protective of the natural resources and it is illegal to collect plant material of any type. Habitat and ecology: A. socotranum, is the characteristic plant of rocky slopes, forming extensive patches of succulent shrubland in favourable locations. Ot grows among stones in grit or on other well drained soil. It displays several morphological and physiological adaptations to cope with the dry climate and fierce monsoonal winds. A. socotranum has a special cell sap cycling within the caudex which prevents overheating. Plant bodies are globular or columnar, with reduced surface areas that decrease transpiration. Glaucous wax surfaces and micro-anatomical epidermal emergences reflect radiation. 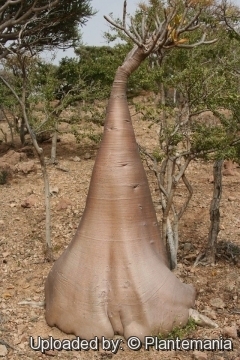 The cycles of flowering and growth of A. socotranum are well adapted to the arid climate, in that it blooms after the rainy season in March-April and only when they are well past flowering do the fruits release their air-borne seeds, leaving them to be dispersed by the heavy monsoon storms. Then the dry season begins with (perhaps) a million adenium seedlings waiting for the next rainy season. 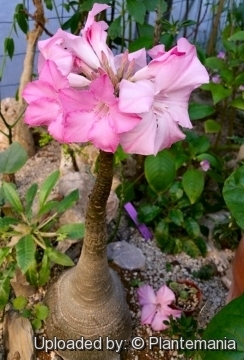 The most common and regular associate in the Adenium shrub layer is the endemic Jatropha unicostata. 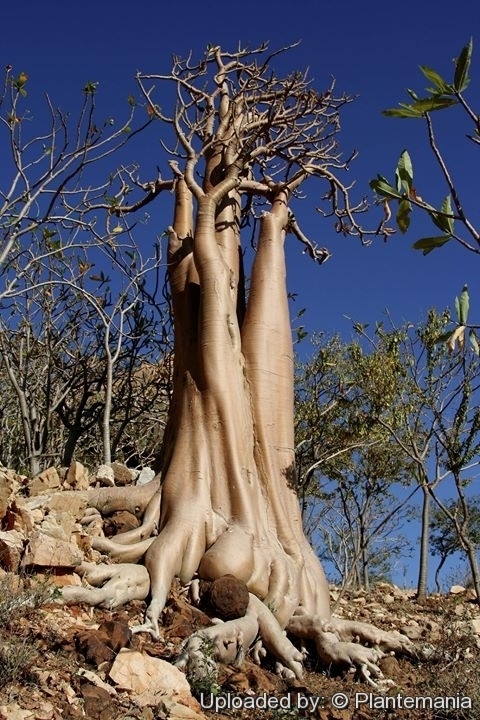 This shrub is perhaps one of the most common species on Socotra. The close association between the two species is probably due to their apparent preference for, or ability to cope with, coarse rocky substrates. Numerous regeneration niches exist in such substrates, offering the seedlings protection from trampling and affording them some degree of shade. The seeds of both species germinate readily after rainfall. Furthermore both species are highly toxic to domestic livestock and as such are rarely browsed. 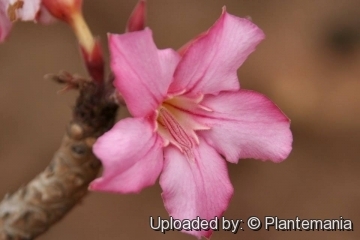 Description: Adenium obesum subs. socotranum (Adenium socotranum) of the periwinkle family, Apocinaceae, is the giant of the genus, forming a massive conical trunk/caudex several metres tall and up to 2.4 m in diameter, the whole plant up to 3,5 meter in height. 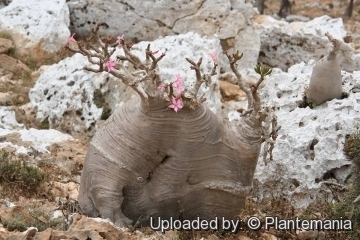 It resembles a miniature baobab with surrealistic forms. Some turn into tall trees while some may grow with their swollen bases more flat on the soil. This species - virtually unknown in cultivation - is frequently indicated to be a winter grower but the few plant observed in European collection are in leaf only during the summer months, leafing out even later than Adenium boehmianum. Stem: Solitary or multiple bottle-shaped trunk/caudex, swollen, vertical, conical more or less distinctly striated (a unique character in the genus) the twiggy branches are few short and thin. Leaves: About 12 cm long, usually widest near the tip, dark green with a white midrib and light major veins. They are glabrous in dense terminal rosettes. Flowers: The plants flower in late spring, with blossoms pale to medium pink with pink or yellow throats. Some specimens in the wild have deep pink to nearly red flowers. Flowers are 10-13 cm in diameter. Very rarely seen flowered in collection. Seeds: Big, about 1.5-2 centimeter. Remarks: If placed in a large container the differences between species will become more obvious. A. socotranum develop a swollen base while the plant is still quite young more rapidly than it strictly relatives (such as Adenium arabicum and Adenium multiflorum) that branch more freely but stay thinner, while some (Adenium obesum ssp. boehmianum) don't develop much of a caudex at all. Notes: Some individual trees seem to suggest the human form — an impression that is reinforced by the frequent small depressions in the smooth bark, which look like navels in a pale unhealthy human skin. different growth patterns. It very slow growing and even a young collector will not live long enough to grow a specimen resembling the wild plants.